Alright y’all, so listen. I’m just gonna be honest about something right up front. The best peanut brittle that I’ve ever had comes from my grandmother. That recipe is one that I’ve been eating, and now using, nearly all of my life and it’s unmatched by any other peanut brittle I’ve tasted. Her recipe is the best. All others pale by comparison. Having said that, I can now also say that this year was the first time that I made peanut brittle that wasn’t hers. The main reason was curiosity; because the ingredients I was using were a bit different, I wanted to see how it would turn out. If you’ve been following along with the 12 Day of Christmas series at all, then you’ve also seen that I’ve used what I called a Winter Spice blend in another recipe, which brings together spices that I think give baked goods an extra ‘Christmas-y’ taste. As most peanut brittle isn’t flavored with much else but peanuts, sugar and vanilla, I also wanted to see how it would taste if there were extra spices added to it. Couldn’t hurt to at least try, right? I say all of this in the recipe instructions, but because it’s so important I’m going to make the time & space to give those same housekeeping instructions here too. Guys, listen. If you choose to make this, or ANY form of brittle in general, it’s very very important that you take this advice. #1) Grease your sheet pan up with butter and shortening. Slather it on there, to all four corners. Do this before you do ANYTHING else in the recipe directions. Make sure that it’s good and schmeared on. Why? Because you’re not going to have time to do it while the candy is cooking, or after you take it off the heat, and if the sheet pan is not properly greased, the brittle will stick to it. You might (BIG might) still be able to get it off but you’d likely have to use a mallet or chisel to smash it into inedible crumbs/dust/powder. If you grease it ahead of time, it will pop right out, no problem. #2) Pre-measure all of the ingredients before you begin. There is a very small window between the time where the candy reaches hard crack stage and where you need to add the baking soda, vanilla and spices to it. You’re already going to have been standing over a hot stove, stirring your tush off to make sure the caramel doesn’t burn and are going to have to move fast between taking it off the heat and spreading it into the sheet pan. It will go a lot smoother if all you have to do is reach to your right or left, and pour the stuff in as opposed to scrambling to measure everything out WHILE STILL STIRRING to keep it from sticking. Don’t ask me how I had to find this out for myself. Just take the advice. Provided you follow my instructions to the letter….ta-da! This is what you’ll get. Pretty cool, huh? I’m not going to say this brittle is as good as my grandma’s–no peanut brittle is, that’s my story and I’m sticking to it. But I did like it very much. And gosh, did it get rave reviews from everyone that I shared it with. I think if you’re looking for a different twist on peanut brittle then this is it. I’m gonna go ahead and link this up to Fiesta Friday #202, co-hosted this week by Judi @ cookingwithauntjuju.com and Laurena @ Life Diet Health. Before you do anything else, thoroughly grease a 15 x 10 sheet pan with softened butter or shortening. Have a kitchen towel or 2 pot holders ready to place beneath it. Get all of your materials and ingredients measured and set out ahead of time on the countertop. 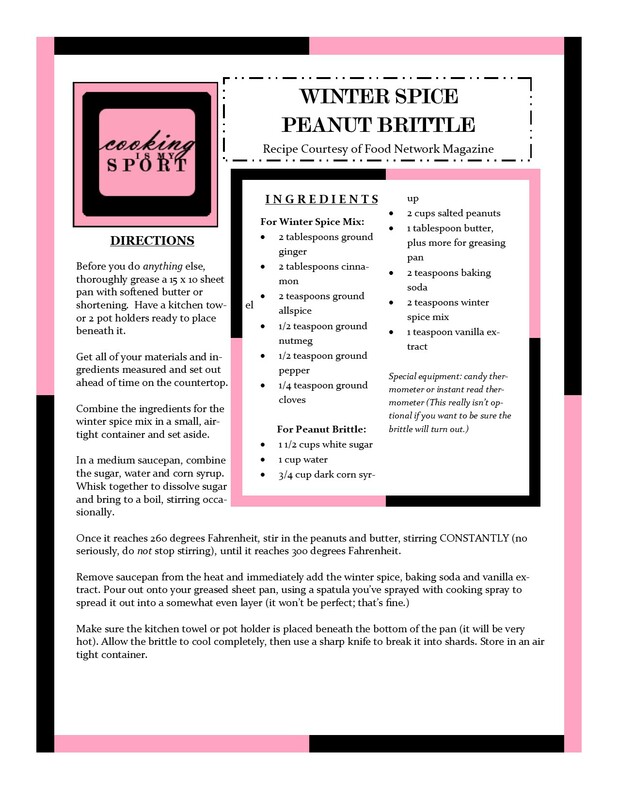 Combine the ingredients for the winter spice mix in a small, air-tight container and set aside. In a medium saucepan, combine the sugar, water and corn syrup. Whisk together to dissolve sugar and bring to a boil, stirring occasionally. Once it reaches 260 degrees Fahrenheit, stir in the peanuts and butter, stirring CONSTANTLY (no seriously, do not stop stirring), until it reaches 300 degrees Fahrenheit. Make sure the kitchen towel or pot holder is placed beneath the bottom of the pan (it will be very hot). Allow the brittle to cool completely, then use a sharp knife to break it into shards. Store in an air tight container. Thank you so much Josette–peanut brittle is VERY hard to photograph and make look appealing. Merry Christmas to you too! Nothing will ever compare to a “grandma’s recipe” but it is fun to try different ingredients. I like the winter spice – I just might have to try this. Thanks for coming to the party Jess and sharing with Fiesta Friday. I hope you like the brittle, it was gobbled up and praised to the heavens by everyone I shared it with lol Thank you ma’am! I’ve never made any type of brittle but this looks and sounds delicious. Thanks so much for linking and sharing at Fiesta Friday. It’s definitely worth trying out and making yourself–I hope you get around to it sometime, thank you!